Abandoned in the zoo by her father when she was a little girl, Lana grew up surrounded by animals, boundaries and the sounds of a subdued wilderness. Raised by animal trainers, the zoo is the only world she knows. She learns to appreciate the graceful steps of the hippo, the elegance of the giraffe, the dignity of an elephant flipping it's ears. As time passes, Lana forgets her father. One day, a handsome young man enters her world, a charismatic cowboy who knows some magic tricks and charms her. Lana falls in love and becomes his assistant in performing magic. At his side, she leaves the zoo for the very first time. But one day, during one of his performances, the magician disappears in a puff of smoke. Lana is hired by a massage parlour to work as a masseuse 'with benefits'. In her heart she sadly longs for the magician and the animals that used to make her world a world full of meaning. Between remembrance of things past and the desire to find her own path Lana has to make up her mind. She slips away from the massage parlour and sets out on a quest for a possibly impossible place: home. 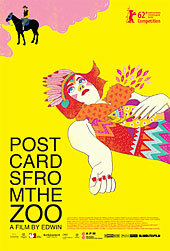 „Postcards From The Zoo“ is a story of longing. In a world that was never built to be a home, young Indonesian director Edwin presents an enchanting romance full of myths, magic and memories. A sensual adventure that is at once unsettling and life-affirming, arranged in beautiful and dreamlike images.